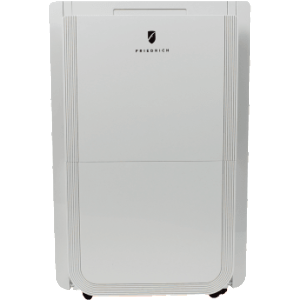 Friedrich - D70BP : Dehumidifier Review • The Air Geeks, reviews of air conditioners, dehumidifiers and air purifiers. The D70BP is a strong dehumidifier that is capable of pulling up to 70 pints of moisture from the air per day. This unit blends powerful features that make it a suitable option for people who are looking for a system that does not need regular attention. Whereas most dehumidifiers in the market today depend on the force of gravity to drain the captured moisture to a sink, this unit features a strong built-in drain pump. If you have been having a problem with excess moisture in your house and you are planning to get a humidity control system, then you have landed in the right place. We have researched widely to provide you with correct and unbiased information about its performance, features, pros, and cons. Without wasting time, let us start with its detailed description! First and foremost, the D70BP is a powerful dehumidifier that offers a capacity of 70 pints per day. At this capacity, this unit is capable of capturing moisture from the air to leave your room dry and odorless. In addition, this unit effectively lowers the moisture to create an unfavorable environment for mold and mildew. Furthermore, it maintains the desired relative humidity level to ensure that excess moisture does not destroy your furniture and other household possessions. Many dehumidifiers may not be suitable for basements because they lack a pumping mechanism for pumping the captured moisture to a sink that is a couple of feet above it. For the D70BP, this is not a problem. This humidity control system features a built-in subsystem that can pump the captured water to a sink that is up to 15 ft above it. This built-in pump enables the unit to run for a long time with requiring any user attention. What if you don’t want to use the pump? This dehumidifier features a 16.2 pint tank for storing the collected water. For high humidity environments, this unit can fill its tank two or three times in a day. To avoid the cumbersome exercise of emptying the tank, this dehumidifier allows you to use the continuous drain option. You just need to connect the unit to an external sink using a hose. The D70BP features an intuitive user interface that allows the user to control the dehumidification process with ease. Depending on your preference, you can set the humidity level between 30 and 90 percent. In addition, this unit displays the temperature and humidity values as a percentage. Furthermore, the D70BP offers a 2-speed fan and a washable anti-microbial filter that ensures that your room gets dry and clean air. To enhance portability, this humidity control unit features built-in caster wheels. Some dehumidifiers have longer on/off cycles. For the D70BP, the cycle is too short and the unit keeps going on and off after achieving the desired humidity. 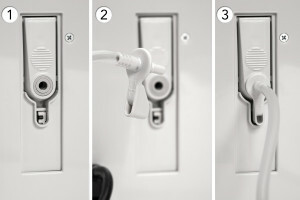 Considering that the unit has a loud fan, these on/off sequences can create disturbing sound patterns. Although most dehumidifier produce some heat, we have observed that the D70BP can cause a noticeable temperature rise if it is left running for a long time. For users in hot areas, this characteristic can be unbearable. However, this characteristic may not be a problem for people living in cold environments. Built-in pump enables this dehumidifier to pump the captured water to a sink that is a few feet above it. This is a big plus because many dehumidifiers in the market depend on gravity. Intuitive controls. The user can easily set the desired value of relative humidity. Effective dehumidification. This strong dehumidifier lowers the relative humidity to create a comfortable environment that is free from mustiness. Short cycles. Once the unit has achieved the set humidity level, it rapidly switches between on and off. We have observed that it can go off and restart almost immediately. This sequence creates disturbances because the fan is relatively loud. Loud operation. We have noted this dehumidifier has a relatively loud fan. As such, the unit can be a source of disturbance if it is placed in a quiet place. The product arrived timely and was very easy to set up. Also, the unit is much quieter than I expected and very efficient. The first 10 days I emptied the pan effortlessly every day and then decided to try the automatic pump. The pump mechanism was a very pleasant surprise as it was very easy to start using, simply plugged into the back of the unit and it distributes the water through a 15 foot tube into the sink which is about 4 feet higher than the unit. An excellent choice for our finished basement of about 1500 s.f." I have owned my Friedrich dehumidifier for little over a month now. Pro's: 1.It works extremely well to remove the humidity. 2.The controls are easy to use. 3.The unit is attractive and reasonably quiet. 4.The digital readout of temperature and humidity is great to have. 5.Casters included for easy mobility. 6.Filter is washable and easy to remove and replace. Con's: 1. The pump hose has to be done very carefully otherwise the unit will leak and the hose provided is short. 2. The removeable condensation bucket is a lot smaller than similar dehumidifiers I have owned this size and poorly constructed. The sides of the bucket are very weak and you have to use both hands to support it when taking it out to dump it. And forget using the handle, it easily slips out of the slots used to hold it in and you could easily spill water all over like I did the first time. I am working on setting it up to continuous drain so I don't have to mess with the flimsy bucket. I am very happy with the machine and the power just not the bucket and pump. Update: The unit is still running strong as of May 28, 2014. Now that I have it hooked up for continuous drain it is no hassle. The air filter cleans easily too!" This attractive dehumidifier offers impressive features and good performance. Its built-in pump makes it a suitable choice for basements and other places where gravity cannot be relied upon. This dehumidifier impressively pulls a lot of water from the air and it is therefore a good option for relatively large spaces. Although this unit has some impressive features, we have observed that it has short on/off cycles. Its fan produces loud sound that can be disturbing if the unit is placed close to the television or in the bedroom. If you are sure that these drawbacks won’t be a problem to you, then you should consider this unit. Having considered its features and performance, we can confidently say that this dehumidifier is worth its price, $230.